We have even more great news to report about a series of robberies in Southeast Lakeview and Lincoln Park in October. Ongoing investigative work by Area North detectives and the 19th District robbery mission team has resulted in two more arrests in connection with the cases. Last Friday, we reported that 19-year-old Deontae Hollins and 22-year-old Breann Taylor of Englewood had each been charged with two felony counts of robbery and one felony count of aggravated robbery-indicating the presence of a firearm. Deontae Hollins (left) and Breann Taylor were arrested last Friday. Now, two more suspects are in custody. 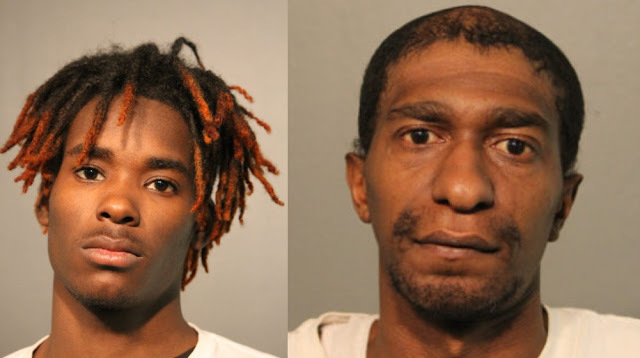 Thomas Wilson, 33, and 18-year-old Keonte Hollins were arrested by 19th District officers Wednesday evening at a home in the 6300 block of South Laflin. Investigators learned that both men had been captured on video using credit cards taken in the local muggings, police said. Keonte Hollins (left) and Wilson were arrested in Englewood two days ago by 19th District cops. Keonte Hollins is charged with two counts of felony robbery and one count of felony aggravated robbery. Prosecutors say he participated in the Wrightwood, Surf, and Aldine hold-ups. Judge Sophia Atcherson set his bail at $100,000. Wilson is charged with one count of felony robbery for helping others with the Wrightwood mugging. Judge Atcherson released him on a $10,000 I-Bond. Court records show that Wilson was charged with a South Side robbery in January 2004. The state eventually allowed him to plead guilty to a reduced charge of battery for which he was placed on probation for one-year. • A juvenile offender remains at large, but an arrest is expected soon. Robbery cases generally go unsolved unless offenders are caught quickly after a hold-up. It's great to see these aging cases end with the arrests of an entire crew.